The Philadelphia Flyers acquired rookie Brayden Schenn last summer in a blockbuster trade that included Wayne Simmonds from the Los Angeles Kings for former Flyers captain, Mike Richards. When Schenn left Hollywood and came to the city of Brotherly Love many questioned Dean Lombardi's decision to ship out one of his organization's top prospects. 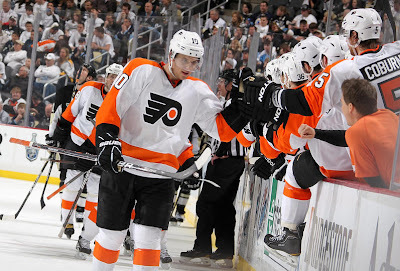 Over the course of the regular season Schenn played in 52 games, scored 12 goals and recorded 18 points. Schenn did suffer a broken foot when he blocked a shot against the Montreal Canadiens, and missed a few weeks of play which may have hindered his production during his first real stay in the big league. However, in the first game of the 2012 Stanley Cup Playoffs, Schenn played with the composure and looked like anything but a rookie. In Schenn's first career playoff game, he recorded just over 16 minutes of time on ice, assisted on the Flyers' first two goals, scored the tying goal with less than ten minutes to play and finished the game with a plus three rating. Flyers rookies, Matt Reade and Sean Couturier have had great rookie campaigns and played pivotal rolls in the Flyers successes this season. The success of other rookies on the teams may have caused most to forget about Schenn or at least place him in the back of their mind. But if Schenn continues to produce when it matters most he will be the Flyers go to rookie because when he performs and not his production in the past. If Schenn does prove to be one of the Flyers' surprise heroes during the playoffs, Lombardi and the Kings faithful sure will hate losing this kid.